Do you remember our unboxing video from earlier this year? 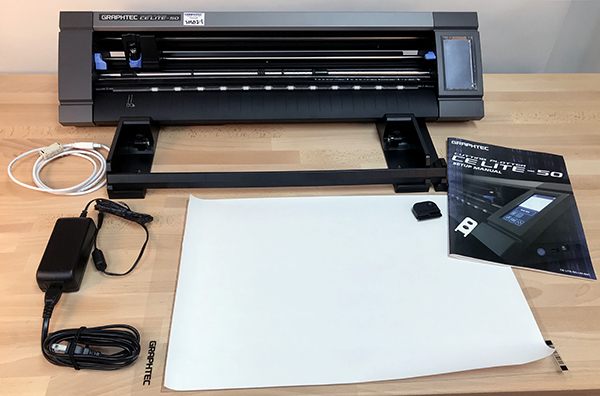 Our friends over at Graphtec were kind enough to send us one of their newest pieces of equipment: the Graphtec CE Lite-50! So we enrolled ourselves in summer school and took our time getting to know the ins and outs of this cutter. Well it’s almost time for the regular school year to resume (if it hasn’t already in your area!) and our schooling on this cutter is over, but it’s time for yours to begin! Today I’m happy to share this easy to follow step-by-step tutorial with you! This first step I’ll skip though, and that is plugging in and connecting the CE Lite-50 to your computer. Graphtec has a video for those steps here. What is the Graphtec CE Lite-50 & What Does it Come With? Graphtec is best known for their high quality, standing roll-feeder and flat bed cutter/plotters, like the Graphtec CE 6000-60, which we use in the office to cut large runs of in house samples. The Graphtec CE 6000-60 is a 24″ cutter with a stand. 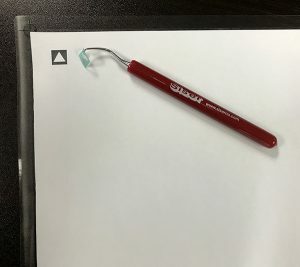 Now, Graphtec has taken all the creative ingenuity of their standing cutters and applied it to a desktop version. The Graphtec CE Lite-50 is a desktop cutter that cuts media up to 20 inches wide and 118 inches long! While this cutter could seem like just another craft cutter, it has a few features that put it up above the rest. For instance, the roll media stocker comes with each purchase and is adjustable to fit a variety of sizes. If you want to know all the technical specs, like how fast it can cut and how much force it can cut with, watch this video or view a full list here. Also included, but not pictured is the Graphtec Pro Studio software that can be downloaded directly from the Graphtec America website. I’ll be honest with you, the software took me some time to get used to, but I love having the option to tile, nest, and add weeding boxes to my cut files – which are super handy production features that are not usually included with other craft cutter softwares. Oops! I’m getting ahead of myself. Let’s start with something simpler, like inserting text! Begin by opening Graphtec Pro Studio. 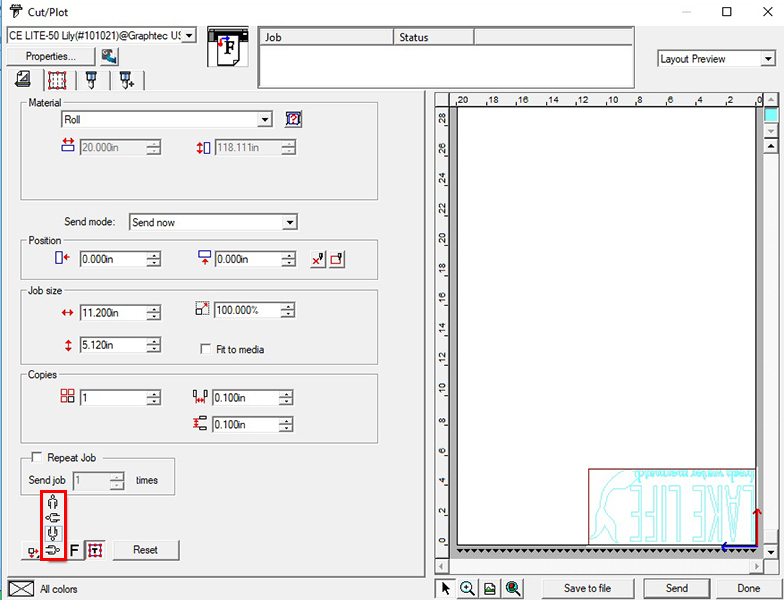 A new file will automatically be created where you can start designing. I love that you can have more than one design board open at a time. Simply click on Window to toggle between the other open files. 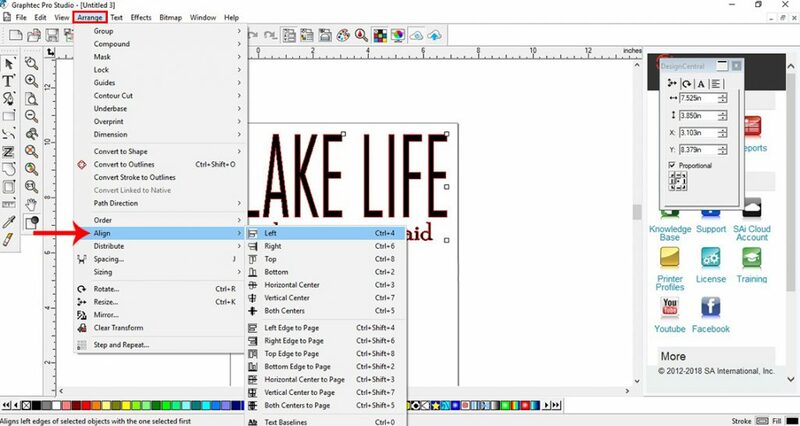 To insert text, click on the large T and left click anywhere in the designing area. You do not need to draw a text box. After clicking, a blinking line will appear to indicate you’re ready to start typing. When you’re finished typing your name, phrase, etc. 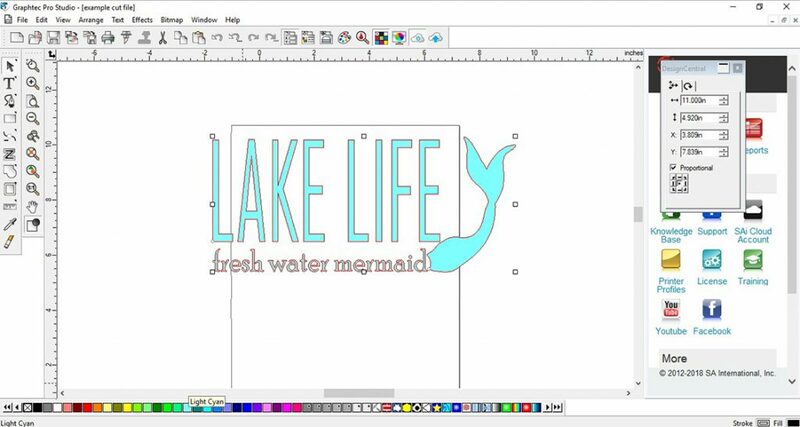 it’s time for every crafter’s favorite part of designing- fonts! Or is it just my favorite? I feel like crafting enables hoarding – vinyl, blanks, fonts… at least I’m surrounded by pretty things! 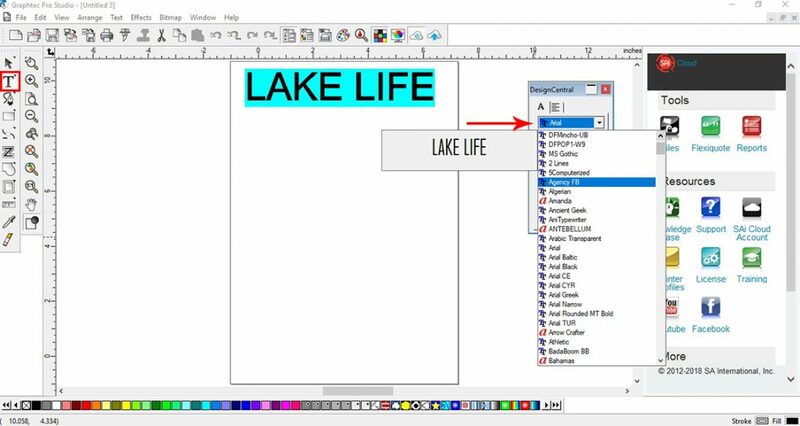 Use the drop down menu in the Design Central window to select the font fit for your project. In this case, mine is Agency FB. From here you have two options for re-sizing text. You can either adjust the size proportionally, which means the object’s width and height will change at the same rate in relation to each other, OR you can adjust the size un-proportionally which means you can change the height while the width stays the same or vice versa. 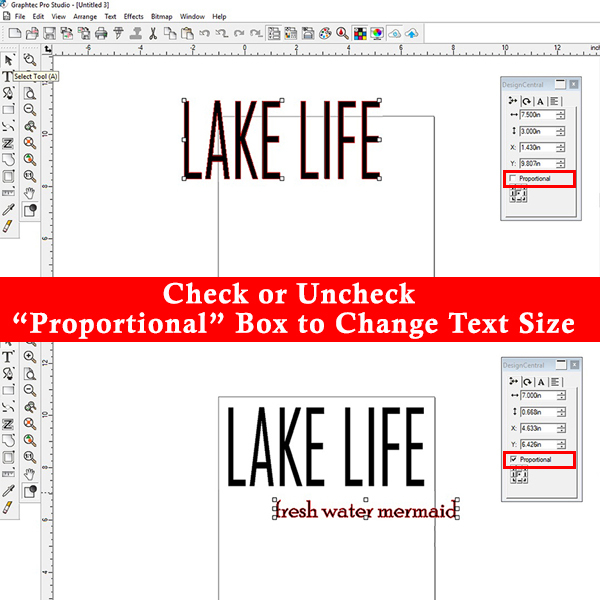 I unchecked the Proportional box will changing the height of “Lake Life”, so I could stretch the letters and make them tall. But I checked the box while I re-sized “fresh water mermaid” because I wanted to keep the way it looked while shrinking everything down at the same rate. Afterward, you can align the two portions of text by going to Arrange>Align and choosing a direction. I wanted it to be left justified, so I chose Left. Luckily, simple text based graphics are in style, and a few good words paired with a nice font or two is sometimes all you need for a winning design! In other cases, you may want to use an .svg to enhance your text, or be the entire design itself. 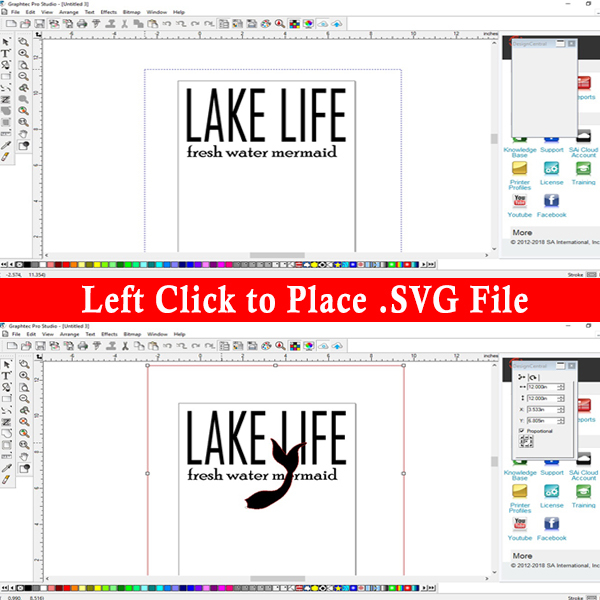 It’s simple enough to bring your .svg files into Graphtec Pro Studio by going to File>Import. A window will appear where you can search your computer for the file you want to open. Pro Studio is also compatible with. jpeg, .png, .eps, and .ai files if you go to File>Open. When importing .svg’s a dashed blue line will appear. Left click anywhere to place the .svg and the line will become solid red. You can get rid of the extra box by going to Arrange>Group>Ungroup or use the shortcut by holding down the Ctrl key and the letter U. 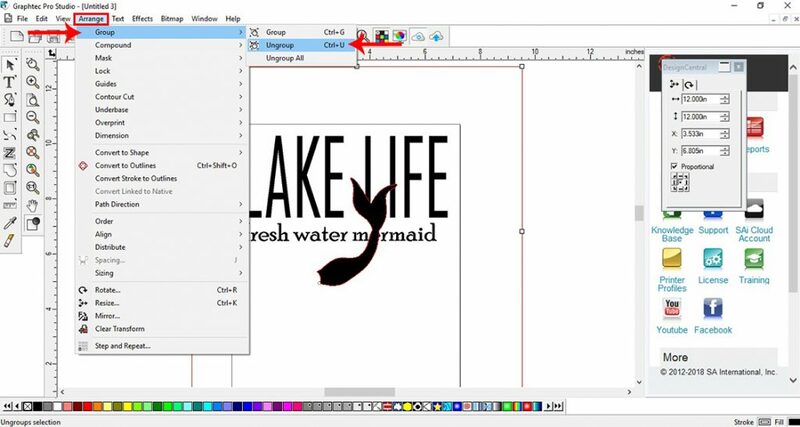 If you’re an Adobe Illustrator or CorelDraw user then you may want to consider using the Cutting Master 4 plug in to seamlessly transfer your designs from one software to the other. 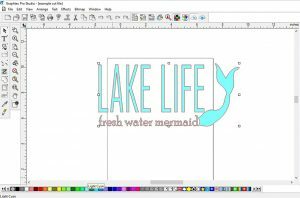 After re-sizing the mermaid tail I held down the Ctrl key and clicked each part of my design. When everything is selected I hit the G key (while still holding Ctrl) to group them all together. Now instead of 3 individual boxes when I click on the design, there’s only 1 big selection box around the outside. From here, I can re-size everything at once, witch a total graphic size of 11″x4.9″. The last thing I like to do is change the color by choosing from the bottom row to envision the file as HTV. With the designing done, we can send this file to the cutter! 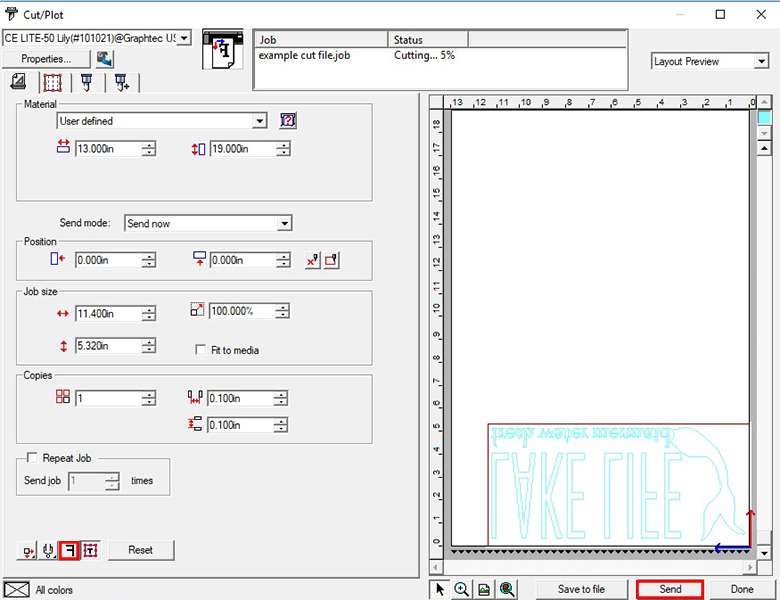 To send the file to cut you can select File>Cut/Plot or use the short cut on the top ribbon. The icon for Cut/Plot looks like a little blade. When selecting Cut/Plot, a window will appear where you can set up your file for cutting. Graphtec Pro Studio Production Manager will automatically open as well. This program is to help manage large production runs, and while it needs to be open to cut, you don’t have to set anything in it in order to send 1 cutting job to the CE Lite-50. 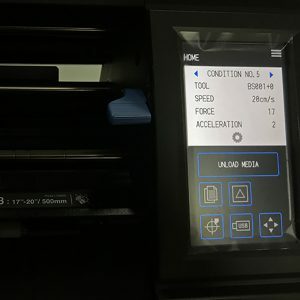 Another way to send your file to the cutter is to save it to a flash drive. 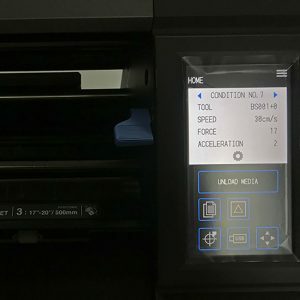 Plug the flash drive directly into the CE Lite-50 to cut without a computer connection! 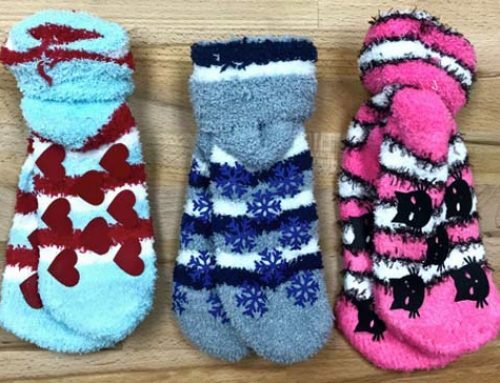 The design is automatically placed in the lower right corner of the mat. Notice the black triangles on the short edge? These are indicators to let you know that this is the edge that gets fed into the CE-Lite 50 first. You can change the orientation of the design by selecting Rotate which looks like a human figure. Whichever way the head of the figure faces, so will the top of your design. Need a closer look? Change from Layout Preview to Panel Preview to see the mat up close. I like to work in Panel Preview while I add a weeding box. Weeding boxes are one of our favorite HTV hacks. 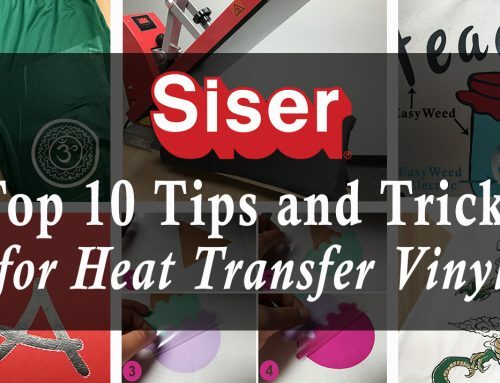 Read more about them in Siser’s Top 10 Tips for Heat Transfer Vinyl. To enable the weeding box, move from the General panel to Options. The icon for Options is the same symbol as Cut/Plot. Now you can check the Weed Border box under the Weed Lines section and a black box will appear around the edge of your design. You can adjust how close the sides of the box are to the cut file by increasing or decreasing the Weeding Margin. Finally, since we’re cutting heat transfer vinyl the image needs to be mirrored. Select the F and the letter will flip horizontally along with your entire cut file. But before you hit Send, make sure your HTV is loaded into the cutter and your cut settings are set. Keep reading to learn how you can do just that! 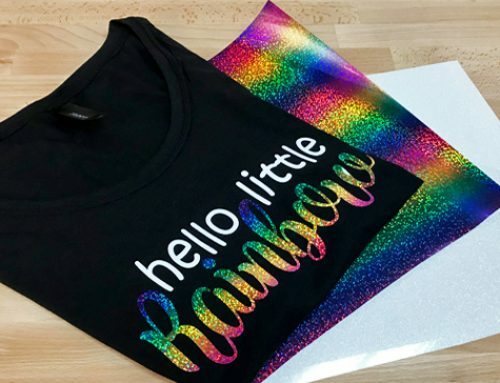 Begin by placing your heat transfer vinyl on the cutting mat with the shiny carrier side down. 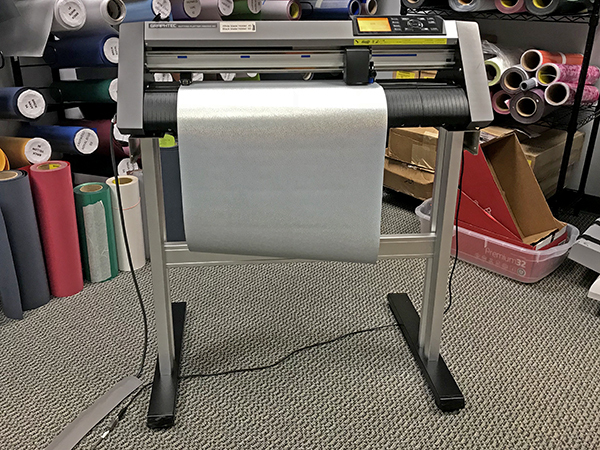 The Graphtec cutting mat is 13 inches wide and 19 inches long, so it can fit under the pinch rollers vertically or horizontally! For my project I’ll be loading the shorter side in, so I made sure to move the right pinch roller in to the 13″ mark. Then I aligned the left edge of the mat with the line guide for sheet (If you’re using the roll media stocker, you’d align the edge with the line associated with the roll symbol) and align the right edge under the pinch roller. When you’ve got your mat in position, select Load Media on the touchscreen and choose Carrier Sheet from the list of options. Carrier Sheet = Cutting Mat. You can see how to load a sheet and roll in this video from Graphtec. The video also demonstrates how to do a test cut. We always recommend doing a test cut before sending your entire design to the cutter to see if your settings are good for the material or if they need to be adjusted. A good test cut is easy to weed, has smooth lines, and has visible cut lines from the blade. A bad test cut is hard to weed, may have jagged lines, and either has no visible cut lines OR cut lines that are either so deep you can feel them or so deep they’ve cut through the carrier. 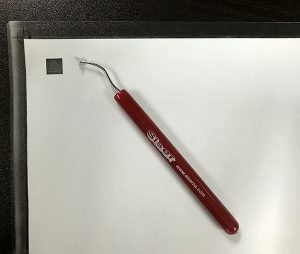 To cut heat transfer vinyl, use the standard blade tool PM-BS-001. The PM-BS-002 blade is for thicker media. For EasyWeed® Stretch I used the pre-set Condition No. 5 since it has a slower speed of 20 cm/s. For standard EasyWeed, Condition No. 7 should be suitable. You can change the specifics of the setting when you click the gray wheel in the bottom of the white box. When you’ve completed a successful test cut, it’s time to click Send in Graphtec Pro Studio and sit back to relax while the CE-Lite 50 works it’s magic… well you might not be able to relax too long, since this thing zips along at a quick rate! When it’s done cutting, select Unload on the touch screen. Now you can trim, weed, and heat apply the HTV like usual! 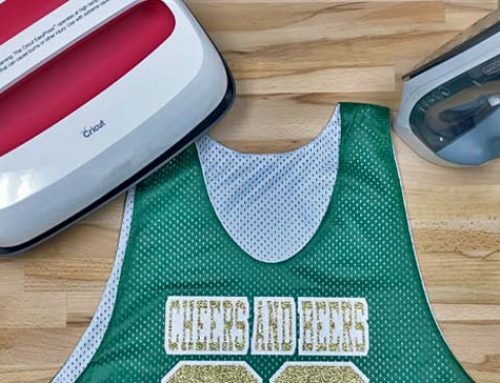 Going from cut file to custom tank top is quick and easy with the new Graphtec CE Lite-50 and Siser® heat transfer vinyl! 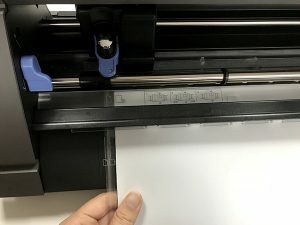 Have you tried this 20″ desktop cutter? Tell us about your experience in the comments, or feel free to leave any questions you may have! Pin the image below to keep this tutorial handy! Lily is Siser's go-to crafter. Her ideas and abilities to incorporate HTV into her projects is inspiring. 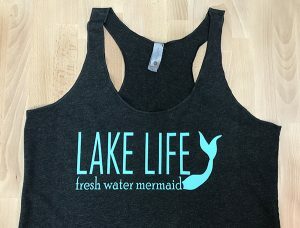 Well versed in Heat Transfer Vinyl, Lily embraces the methods and materials to deliver creative content week after week! Hi, and thanks for your question! A free activation code for the Graphtec Pro Studio license is included with the purchase of the CE Lite-50. Can it work with versa works or do we need pro studio sotware? Hello! 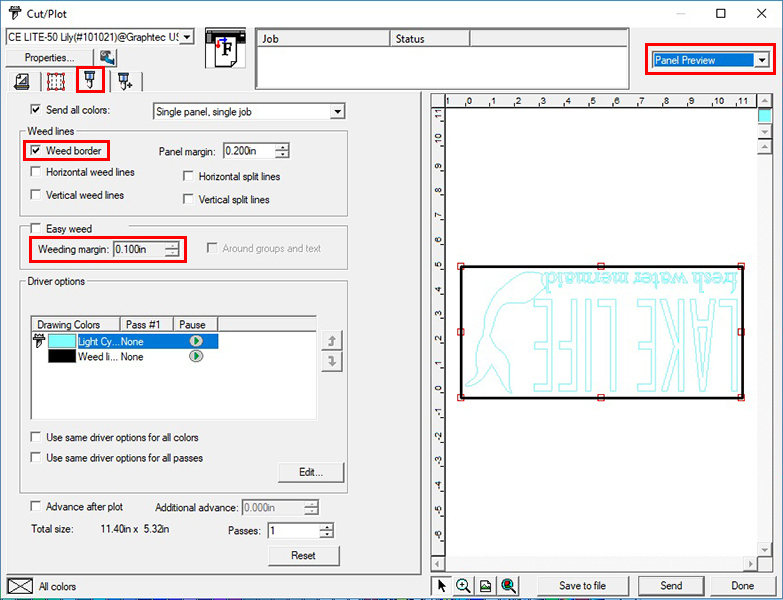 Designs can be saved from Graphtec Pro Studio as a PDF and then opened in versaworks RIP to print, but that’s it compatibility wise. Will the software work on my mac book? I tried some softwares that said they were not compartible. 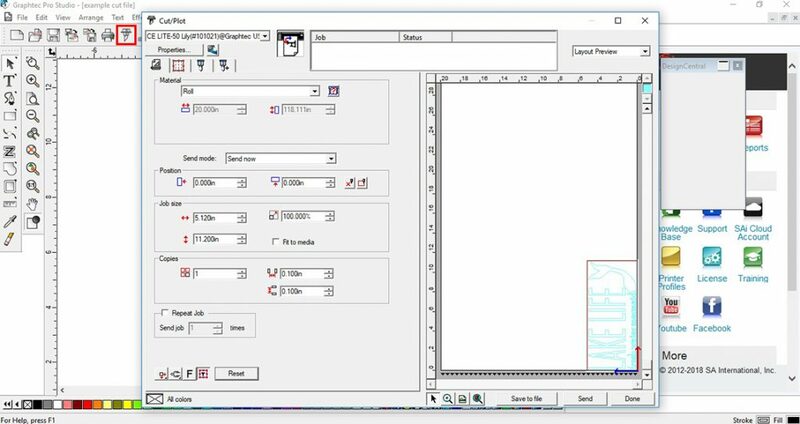 There’s a Mac version of the Graphtec Studio software, which is similar. But Graphtec Pro Studio (which I use in this post) is only available for Windows. Hi there, I recently just got the CE-LITE 50 and this was very helpful. Thank you. I cannot find many videos or tutorials on the cut settings. On this video, are you using the blade that came with the cutter or the CB09 blade? If you did use the one that came with the cutter, what number did you set it to and if you used the CB09, how do you figure out where to set it so I don’t have to keep changing the depth of the blade? I’ve heard tons of people say that just set it to where number 3 or 4 on a reg blade is and you never have to change anything but the pressure(or conditions). I appreciate any advice you can give me. I mostly do glitter HTV and Stretch, Siser, of course. Thanks so much! Hi Amy! 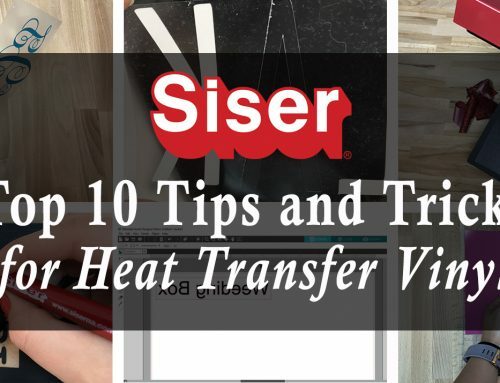 Thanks for reading the Siser Blog! We used the blade that came with the cutter set to 1 for EasyWeed® products since the blade was new and very sharp. You can estimate your blade setting by comparing the blade to the side of the material you’re cutting. If the blade appears longer than the HTV’s depth, then you know that setting will cut through the carrier. You want your blade to be out just enough to scratch the carrier sheet, but not cut through. If it cuts through the carrier, you could damage the machine’s cutting strip. I would not recommend setting your blade depth and only adjusting your pressure/conditions for a long period of time or with different types of HTV. 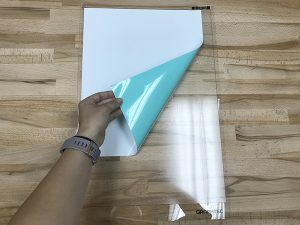 Sometimes even certain colors of the same product will have a different cut setting, so it’s always best to do a small test cut, assess, and adjust your settings before cutting a full design. Get Email Updates When We Add New Posts!